We have all seen and used binoculars, but not many of us actually take the plunge and buy one. This is partly because we don't have a specific use for the product and find the need to have one only when we are on a vacation, that too on a scenic spot. But there are many people who are very serious about their binoculars, among them sports lovers, nature enthusiasts and bird watchers. These users are clear about the specifications they need while buying a device. But what about the average user? 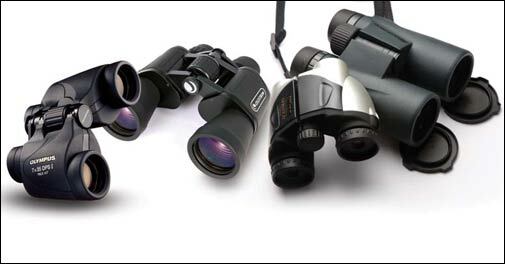 Here is a guide to selecting binoculars. The objective lens is the one opposite the eye piece. The size of this lens is crucial because it determines the amount of light that enters the binoculars. So for low light conditions, you get better images if you have a bigger diameter objective lens. The lens size in mm comes after the x. A ratio of 5 in relation to the magnification is ideal. Between an 8x25 and 8x40 lenses, the latter creates a brighter and better image with its bigger diameter. The lens coating is important because it reduces the amount of light reflected and allows the maximum amount of light to enter. The quality of the lens, meanwhile, ensures the image is aberration free and has better contrast. The best lenses work better in low light conditions as they transmit more light. They also ensure that the colours are not washed out or distorted. Users with spectacles should look for a high eyepoint. FoW refers to the diameter of the area seen through the glasses and is expressed in degrees. The larger the field of view the larger the area you can see. Exit pupil, meanwhile, is the image formed on the eyepiece for your pupil to see. Lens diameter divided by magnification gives you the exit pupil. An exit pupil of 7mm gives maximum light to the dilated eye and is ideal for use in twilight and dark conditions. Since binoculars are an essentially outdoor products, it is important that they have some degree of waterproofing-this is usually denoted as "WP". While regular models can stay under limited amounts of water for a few minutes, the high-end models are left undamaged even after a couple of hours submerged in water. With 7x magnification, porro (double) prism and central focus this is a good option for the budget- conscious buyer. 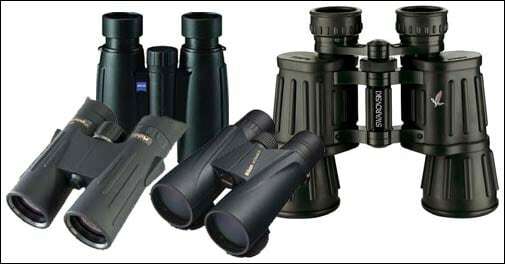 This porro-prism binocular is also ideal for regular use and comes with 10x magnification and has a multi-coated lens. This compact, lightweight model comes with multi-layer coated lens for a clear and bright image. Ideal for sports and regular use this model has 7x magnification and a 35mm objective diameter. This compact device is ideal for travel and comes withamulti-layer coated lens and rubber armour coating. With porro prisms, this is good for birdwatching and nature watching. It comes with Instafocus adjustment and diopter controller and can be mounted on a tripod if needed. This zoom model is ideal for astronomy thanks to the large aperture and multi-coated lens. Needs a tripod though. This weatherproof model comes with a 42 mm aperture that delivers impressive luminosity even in low light helped by the special coating technology and high-contrast-optics. Ideal for birdwatchers. Despite being compact, this model offers a wide objective diameter and high-detail over long distances. Along with the wide objective diameter, this device has a dielectric, high-reflective, multi-layer prism coating for best light and is filled with nitrogen gas to make it fog-free. 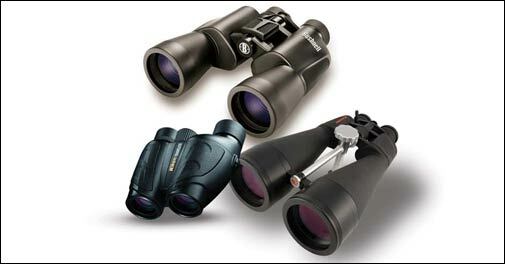 Swarowski binoculars are at the very top due to their superior optics and exceptional build quality. This model promises extrawide field of view and bright, contrast-rich images. Needs wide field of view and magnification of between 7x and 12x. Aberration corrected binoculars with large objective diameter and exit pupil are best. Compact models with magnification of 4x to 10x can be effective while watching stage performances. In museums, lightweight models with low magnification and focusing distance of less than two metres are recommended. Look for wide field of view and 7x to 10x magnification. Zoom functionality can be an added advantage.